Every year, by about mid-March, I get sick of the Canadian winter, and when I don’t have a chance to travel abroad to a sunny place, I look for alternate ways of satisfying my craving for spring colour. 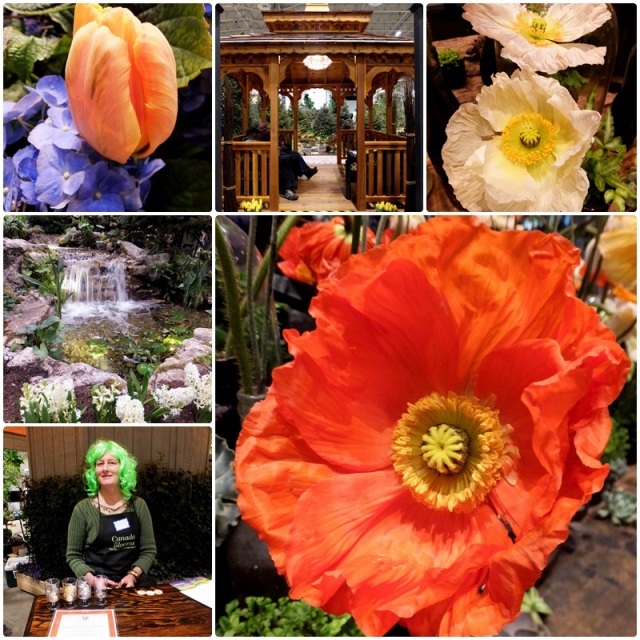 And for the last couple of years, my go-to strategy for beating the winter blahs has been to visit Canada Blooms, Canada’s largest flower and garden show. As an added bonus, an admission ticket to Canada Blooms will also get you access to the National Home Show, a great resource for all renovation and home improvement projects. On the first day of spring, March 20, 2013, I drove to Toronto’s CNE grounds, next to Lake Ontario and parked my vehicle. Parking, incidentally, is free on weekdays, after 4 pm; otherwise the cost is $14. I entered the Direct Energy Centre and went to the media room as I had arranged an appointment with Colomba Fuller, the show’s artistic director. Right when I entered the media room, not only did I get greeted by two friendly ladies, but several stunning arrangements of orchids. Colomba took me under her wings and we started exploring the garden show. Canada Blooms showcases a series of feature gardens, all designed by different organizations such as Sheridan Nurseries, Landscape Ontario, Unilock and other garden design companies. One of the first gardens Colomba showed me was called “Otium” which combines a colourful outdoor gym with beautifully designed flowers and plants. Another garden called “Hope Springs Eternal” centers around a structure of rough hewn timbers from which a wall of water tumbles down. The “Sugar Bush” is a very Canadian garden, showcasing maple trees that are dripping with sap. The sweet smell of maple syrup was permeating the air. “Spring in a Box” is a contemporary garden with strong geometrical shapes that is intended for a rooftop garden or terrace in a condominium. “The Magic of Teamwork” was created by four different teams from one garden design company and showcases four distinct garden styles: oriental, formal, contemporary and naturalistic. A large round gazebo with comfortable sitting areas forms the centrepiece of the “Wine Sensory Garden” and Reif Estate Winery provides wine tastings that are paired with cheese samples from the Dairy Farmers of Canada. “Enchanted Greenery” is a city garden which features a green wall of tropical plants, a beautiful sitting area, permeable pavers which allow the rain water to seep into the ground, and a green roof on the dog house, intended to keep the dog cool in the summer and warm in the winter. Then Colomba introduced me to Adam Bienenstock who showed me through a really neat structure: the Bienenstock Natural Playgrounds. We entered through a wooden fort and saw a 350 year old oak tree that has been carved into a slide for preschoolers. A wooden xylophone allows children to make some music. Then Adam gave me a demonstration on the drums before showing me the interactive fence which is made of metal tubes that are also great for making music. He demonstrated a metal drum that also produces music and can be adjusted to the height of the children. This natural playground looked like a great place for children to have fun and become creative. 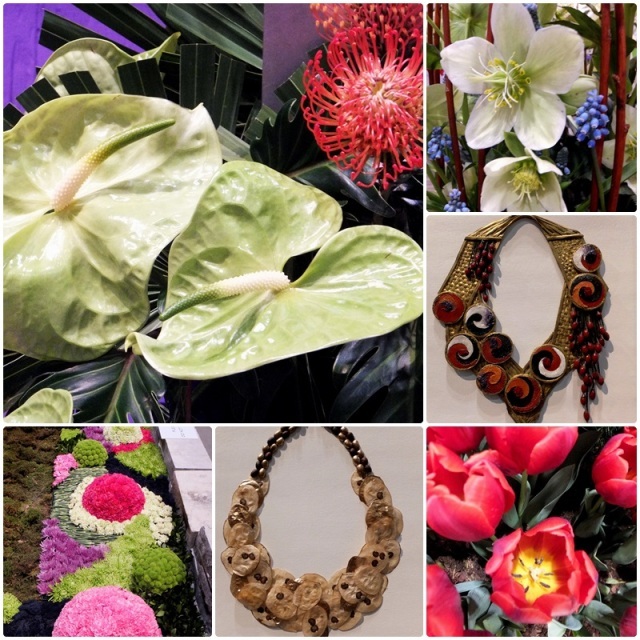 One of the highlights of the Canada Blooms garden show is a display by professional florists from across Toronto who let their creativity go wild. A colourful bed of flowers was fascinating the visitors. “Get Curbalicious”, designed by Remax, the real estate company, showed a display of four houses and their front gardens: a Japanese, whimsical , traditional or classical white display. The Chinese Culture Garden and an Irish Garden introduced gardening elements from other cultures. Twinings Tea Shop was handing out free samples of tea. 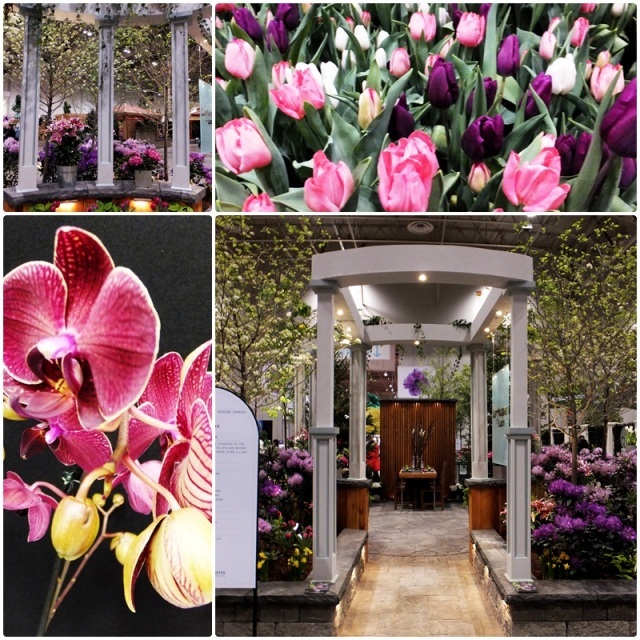 Throughout the 10 days of the Canada Blooms garden show, there are also appearances by Canadian celebrities such as Mark Cullen, Canada’s best known gardener, and Frank Ferragine, the weather and garden specialist at Breakfast Television. Every day there are informative presentations about garden design and a host of other topics on the Celebrity Stage. A visit to Canada Blooms definitely helped me to get out of the winter doldrums. 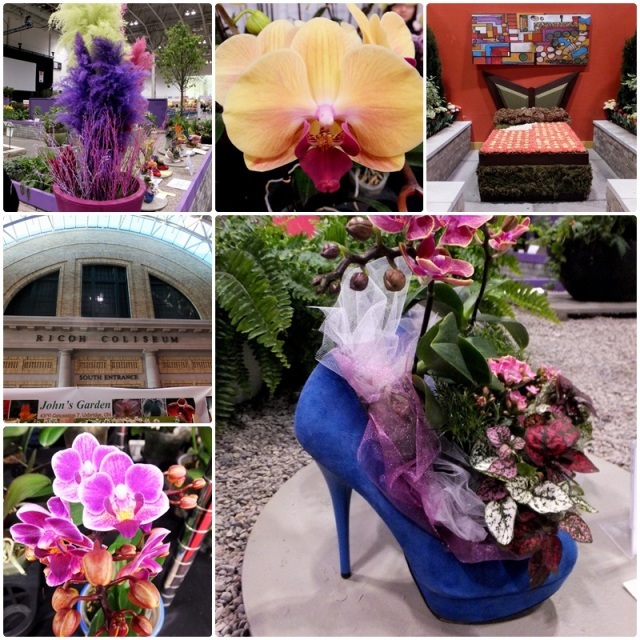 This year, Canada’s most popular garden show is running from March 15 to 24, 2013 at the Direct Energy Centre in Toronto, so if you hurry you can still catch it.